Vegetable stock is a wonderful recipe to make for so many reasons. First it is very healthy. It's a perfect part of a vegetarian or vegan diet, but adds healthy benefits to a more traditional diet as well. 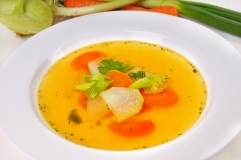 This broth or stock recipe can be used for many things. It is the basis of many a soup, is the start of a great gravy and is perfect to use in small bits as a flavored cooking water. Here is a great tip for storing and using vegetable broth - when it is cooked and ready to store put it in ice cube trays and freeze it. Place all the vegetable broth cubes into a plastic zip bag or other freezer container and it will be ready for use in a thousand different ways. No wasting a whole can or box of pre made stock. Your delicious homemade broth is ready in moments to add wonderful flavor to anything you make. outer leaves of cabbage, lettuce, etc. Heat the oil in a large saucepan and stir-fry the onion and garlic until transparent. Add the carrots, celery and lemon juice. Turn the heat to low, cover the pan and sweat the vegetables stirring occasionally, for 5 - 10 minutes. Add the remaining vegetables and herbs and pour over the water. Season well and simmer, covered for 40 minutes until vegetables are quite soft. If you want to use the broth recipe as a soup, simply blend the stock with a hand blender and add soy sauce to your taste. Otherwise, drain the stock, discarding the cooked vegetables. Ideally, chill the stock in the refrigerator before using it. Any fat will rise to the top and go solid so you can easily skim off the fat before using. Store in the refrigerator to use within a couple of days or freeze in ice cube trays. The directions state that you can use vegetables that are past their prime, but this doesn't mean rotting. If tomato skins are getting a bit wrinkled, that is okay and I would say add them to the soup. If they are beginning to get dark spots or rot, I would throw them out. Take note that strong vegetables like broccoli and peppers add stronger flavor to the stock. I wouldn't use them unless you are sure that you won't mind the flavor in all of the uses you intend for the broth. Olive oil is a bit strong for stock, unless you will like the flavor in everything you will be using the stock in. I would select something like a good quality grapeseed oil. Making vegetable stock is also a wonderful way to use up bits of leftover vegetables. Keep in mind that the soup takes on the flavor of the vegetables in it, so using strong vegetables like peppers will dominate the stock flavor. I would suggest using peppers in the stock only if you really love the flavor in everything you will use the stock for. You can save the water from steaming your vegetables and use that in the broth recipe instead of plain water. It all adds flavor. You will notice there is an optional touch of soy sauce in this recipe. It adds a nice subtle flavor. There is no need to chop any of the vegetables finely. They will be strained out of the stock anyway. Just a rough chop into 2" pieces or so is fine. You will get so may uses out of this recipe, you won't believe it. Any time a recipe calls for 1/2 cup of vegetable stock you will have it on hand. This tasty vegetable stock is just one of our healthy recipes.